Marcela Gutierrez, APRN, is a certified pediatric and dermatology advanced practice registered nurse who specializes in helping kids with atopic dermatitis and has significant experience with numerous dermatologic procedures involving minor surgery, laser hair removal and wart and molluscum removal. She is fluent in English and Spanish and proficient in French. 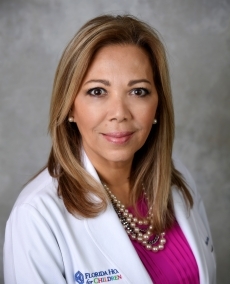 Over her 10-plus years in the pediatric dermatology field, Marcela has independently conducted six pediatric multidisciplinary clinics at the University of Miami Dermatology Department and coordinated and provided care in the vascular anomaly clinic and the genodermatoses clinic. She most recently was a pediatric nurse at AdventHealth for Children, where she performed daily rounds and acted as a liaison between nurses and doctors. Marcela is an experienced Clinical Trial Nurse and has received numerous honors and awards including Nurse Practitioner of the Year in the Emergency Care Center at Jackson Memorial Hospital.